Time to trim the table with holiday cheer! 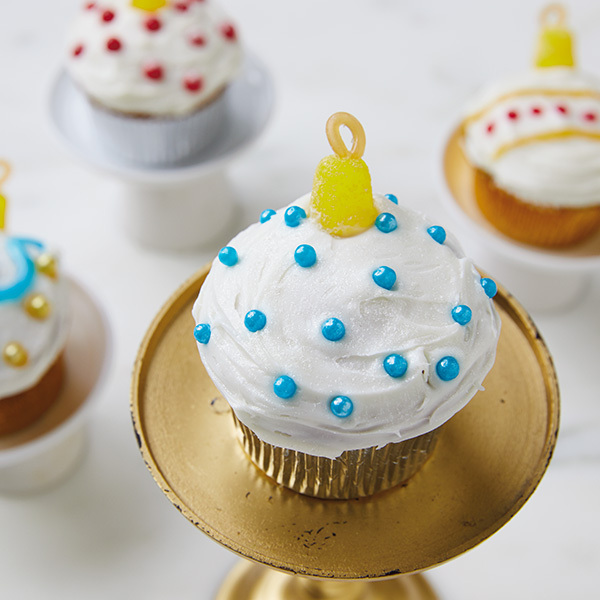 Make your ornament cupcakes with a mix and top them with prepared frosting to make preparation a cinch. These Christmas cupcakes are just the thing to make little creators feel extra jolly. Decorate with sparkle gel and assorted candy pearls. You can copy your favorite ornaments or go freestyle. To create ornament hangers, poke a hole in the top of a spice drop, then fill with a small amount of sparkle gel. Cut a 1 1/2” length of gummy rope and pinch the ends together, then insert into the spice drop to form a loop.